girly I totally tagged you in my post!! :) your right there in the list below the pics!! Of course you could still use it anyway even if I had not. OMG! Europe will be so fun!!!! :) We're not engaged...yet. But it's so weird.. b/c I have zero doubts that he's the one... I hate to put that in writing..haha.. *nervous* ;) But, we actually went to St. Lucia this year for fun and had a blast!!!! :) Trips together are fabulous!! That's such a great list! And I LOVE that pic on your planner's blog where you and your hunny buns are on the slide. It's so cute! I have been lurking here forever, but I just want to say congrats on everything! I became a fan when I realized we both did thankful thursdays kind of things. I just implemented it on my public blog...but on my family blog and on a completely private one I've been doing it for months. It helps you keep perspective! I think I may just jump on this idea thanks to you!! ohh I love your thankful thursdays! the lists are all so beautiful they make me smile, you are so sweet and such a lovely lady, I am so excited for your wonderful day! Your happiness is infectious!! I think I'm going to have to start thankful thursdays! How exciting!! Where are you guys going on your honeymoon? aw lady i'm so happy that you're happy. you deserve all the love and attention. xoxo. I'd love to guest blog for a day for you lovely! That is, if you'll have me! You must be so excited darling!!! Aww how nice of her! What a lovely list to be thankful for! I wouldn't mind being a guest blogger for you. What kind of topics are you looking for? Seriously, what a gorgeous bride you are going to make!! 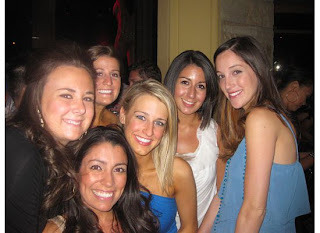 OMG, we partied at TAO and Tryst for some of my Bachelorette festivites, too! Hahahahaha. Love your photos on your Wedding Planners site, too. You look great! And wow, your wedding day is sooo close. It's going to be AWESOMENESS! I love your Thankful Thursday posts... I try to find three things every day to be thankful for, but it's always a good reminder to look around our own lives and realize how much we have to be thankful for! How can you even contain yourself with your amazing wedding only 3 weeks away!?!? I would be bouncing off of walls all over the place! And if you need guest bloggers, I'd be happy to help while you and TL are loving it up in Europe!! Your wedding is just around the corner, thanks for your e-mail. I sent you one a little bit ago. Glad you take the time to recognize all that you are thankful for, that says a lot. You are such a positive and optimistic person, love that about you! ;) I hope TL has a great time in Vegas...happy weekend love! So much to be thankful for, and your friends definetly did a great job with your Vegas party! I'd be happy to guest post for you too! Just let me know! Have a great weekend miss! You do have a lot to be thankful for. A lot of love going around. I'm thankful too. I found a new friend with you. Such a lovely post.....I love how you talk about your Mom and Dad, you are such a sweetheart. Thanks for your lovely comment on my blog - can you tell us again where you are going on your honeymoon....I know you are going to one Italian city, is it Venice? Gorgeous post, darling ~ love the pic and the sentiment!